This Yoga practice supply/tool Eye Pillow *SET* includes:) 1 of our favorites; the *Lavender Eye Pillow AND 1 of the smaller, lighter; *Deep Relaxation Eye Pillow. 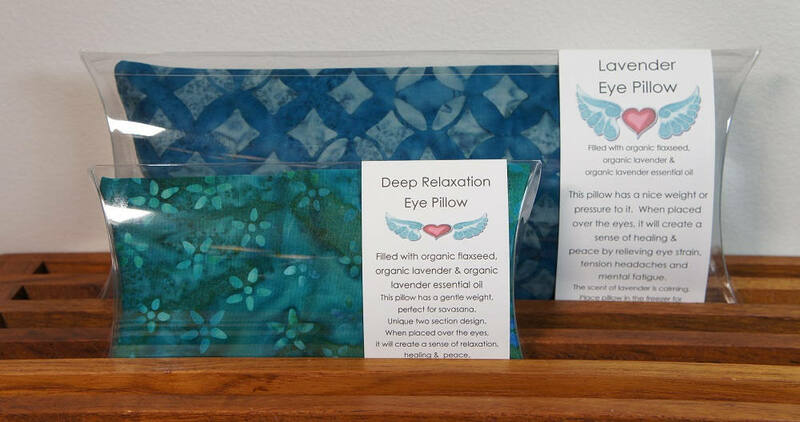 Both Eye Pillows are filled with *ORGANIC* flaxseed and calming lavender essential oil. Place one or both pillows in the freezer for soothing stress relief. The *Lavender Eye Pillow has a nice weight to it, which makes it the perfect tool for Savasana. The *Deep Relaxation Eye Pillow is much smaller in size and lighter in weight, which makes it the perfect tool for a longer restorative practice. With its Unique two section design, when placed over the eyes, it will create a gentle sense of relaxation, healing & peace. The segmented pillow is made out of 100% cotton muslin, removable and washable case is made out of 100% cotton batik. approx. 2.5" x 6.5" rectangular shape. *Lavender Eye Pillow and *Deep Relaxation covers will be from same color choice but not always the same print. Each Pillow is Packaged individually:) keep one, gift one, gift both or keep both!